I was a bit slow to blog this one, which came out in August. In the meantime, someone I pointed it out to says that it’s great apart from “They will stone-cold deduce rules of grammar FROM OBSERVATION ALONE”, and suggests that the author didn't finish reading the chapter on the poverty of the stimulus. The problem, of course, with what T-Rex says is that the whole point of the poverty of the stimulus argument is to establish that infants do not work out grammar from observation alone: rather, there is some innate knowledge of language. But I’m inclined to give T-Rex (or at least his creator Ryan North, who has a master’s in computational linguistics and a dog called ‘Chompsky’) the benefit of the doubt. I think either North or T-Rex is being somewhat ironic. 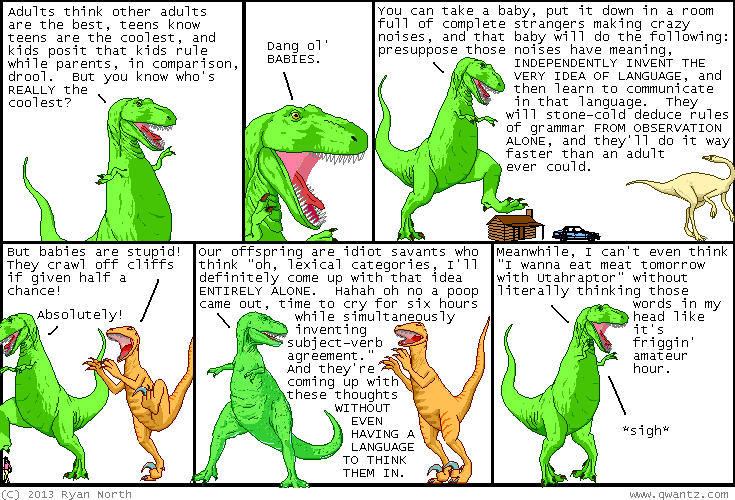 He (whichever one of them it is) doesn't really think that babies independently invent the idea of language or deduce the rules of grammar from observation alone, just that it might seem as though they do – to T-Rex, or to someone he is satirising. Utahraptor is wrong, though, in saying that babies crawl off cliffs given half a chance. In fact we have an innate drop-detector which is available very early in infancy. Babies may fail to distinguish between small and large drops (pdf) though.